When you are looking for bridal wedding jewelry that will add style and elegance for your wedding day, come to Bella-Tiara for the largest selection of wedding jewelry and bridal jewelry anywhere. 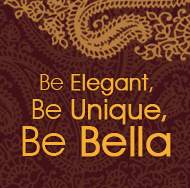 BELLA-TIARA offers the largest selection of popular boutique, couture Crystal Bridal Jewelry. Our extensive line of designer jewels, gems, vintage pins, and dazzling gold and silver jewelry is all you need to accessorize an entire bridal party, a high school girl's night at prom, or a sweet sixteen or fifteen princess on her birthday celebration. 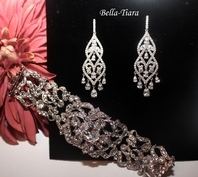 Bella Tiara selection of Crystal, Rhinestone and Pearl Necklaces, sparkling bracelets, dangling crystal chandelier earrings, and bridal party jewelry will make shopping for your special day a pleasure. 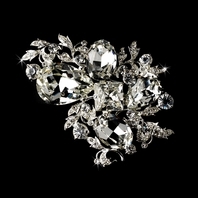 The unique pieces that you'll find in our selection of wedding jewelry are affordable, especially our discounted costume jewelry, and perfect for any elegant affair. Bridal wedding jewelry isn't always just for the bride so at Bell-Tiara brides, bridesmaids, and every woman looking for the perfect accent jewelry for their elegant affair will find the perfect wedding jewelry and bridal jewelry for every special occasion.